Mike Huckabee is so eager to deceive conservatives about his support for amnesty for illegal aliens that he has earned himself the nickname "The Huckster" among illegal immigration fighting groups and activist circles! But check out what ALIPAC volunteer researchers found! 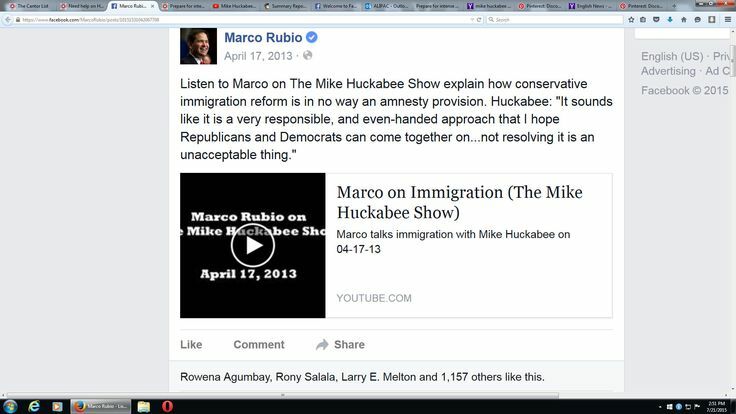 Here is our screen shot evidence from Marco Rubio's Facebook page from 2013 that documents Mike Huckabee supporting Rubio's, Obama's, and Senator Harry Reid's illegal immigrant Amnesty bill S. 744! Mike Huckabee: "It (S. 744) sounds like it is a very responsible, and even-handed approach that I hope Republicans and Democrats can come together on..."
Mike Huckabee's wish came true when 14 GOP sellout Senators joined all of Obama's Democrats to vote for and pass illegal alien amnesty bill S. 744 later in 2013! Mike Huckabee even promises to secure the borders, reverse Obama's amnesty decrees, and crack down on Sanctuary Cities that aid and abet illegal aliens, but all of these promises are hollow because his support for amnesty for illegals would add 12-20 million voters to the Democrats' power base that would quickly erase any immigration enforcement gains! But take a look at the Huckster's real positions on amnesty for illegal aliens. Back in 2006-2008 when the administration of GW Bush was hell bent on passing "guest worker" amnesty for illegal immigrants, Mike Huckabee was all on board for it! I tend to think that the rational approach is to find a way to give people a pathway to citizenship. You shouldn’t ignore the law or ignore those who break it. But by the same token, I think it’s a little disingenuous when I hear people say they should experience the full weight of the law in every respect with no pathway, because that’s not something we practice in any other area of criminal justice in this country…. To think that we’re going to go lock up 12 million people, or even round them up and drive them to the border and let them go, might make a great political speech, but it’s not going to happen. ...has advocated prenatal care for pregnant immigrants and has proposed a scholarship program for illegal immigrants who graduate from Arkansas high schools. He also criticized a 2005 federal immigration raid in Arkansas. Huckabee has expressed support for a path to citizenship for illegal immigrants. Mike Huckabee supports in-state tuition subsidies for illegal aliens which has been defeated in most states because such legislation forces American taxpayers to pay to replace our own children and grandchildren with illegals in the limited seats in US Colleges! Mike Huckabee's soft and accommodating stances supporting illegal immigrants should be no surprise because as Governor of Arkansas, the Huckster was notorious for granting clemency for violent criminals. In fact, in 2000, despite objections from prosecutors, Huckabee granted clemency to a man named Maurice Clemmons, and Maurice Clemmons went on to murder four Washington State police officers. These officers left behind husbands, wives and children! Does this sound like a man who is going to be tough on illegal immigration and illegal immigrants? Or does Mike Huckabee sound more like a man who would unleash violent illegal aliens from American prisons without deportation like Obama does? Not only does Mike Huckabee lie about his true immigration positions, support Dream Act Amnesty, and support benefits for illegals like in-state tuition, but he also uses his public profile and his prior show on Fox News to support other legendary amnesty supporters! In the elections of 2014, when brave American patriots did their best to unseat incumbent GOP amnesty supporters like Congressman Eric Cantor (R-VA) and Senator Lamar Alexander (R-TN), Mike Huckabee's fans revolted when The Huckster endorsed Senator Lamar Alexander in his GOP primary battle against challenger Joe Carr! Senator Alexander was one of only 14 GOP Senators to vote with Obama's Democrats to pass amnesty bill S. 744 out of the US Senate in 2013! And not only does Mike Huckabee lie about his immigration positions, support amnesty, support benefits for illegals, and endorse amnesty-backing lawmakers like Lamar Alexander, but he also supports and attends illegal immigration and amnesty supporting group conventions! Mike Huckabee joined notorious amnesty supporters Rep. Luis Gutierriez (D-IL) and Jeb Bush (R-FL) as a keynote speaker at the National Hispanic Christian Leadership Conference (NHCLC). The NHCLC President NHCLC President Rev. Samuel Rodriguez has been vocal about the focus of the conference being on immigration reform amnesty and the NHCLC is also a member of the Evangelical Immigration Roundtable, which has been vocal in its support for comprehensive amnesty legislation. While it is clear that Mike Huckabee's latest round of deceptive tough talk on illegal immigration began with the launch of his 2016 Presidential campaign, he probably came out strong on the issue because his support for amnesty cost him is chances when he ran for President in 2008! Mike Huckabee tried to sound tough against illegal immigration when he ran for President in 2008, but ALIPAC's research and documentation proved that his plan to make "illegal aliens leave America" to satisfy our current laws that require illegals to go home was really a ruse and illegals could sign up for documents and return to the US in only "one day"! We denounce Jim Gilchrist's solo endorsement of a pro-amnesty and Open Borders candidate for President. Mr. Gilchrist does NOT speak for us! Mike Huckabee is pro-amnesty and favors a "path to citizenship" for illegal aliens currently in the US, which would require a lifting of the current penalties. Mike Huckabee is against ICE raids and decried them in his home state, when illegal aliens were arrested at companies that financially support his campaigns. Mike Huckabee supports benefits for illegal aliens such as taxpayer subsidized in-state tuition. Governor Huckabee also favors a "touchback" provision, which we feel is a trick to confuse voters. He would have illegal aliens leave for a day, pick up new papers, and then reenter the US LEGALLY, which is not the back of the immigration line! He has stated that illegal aliens could leave and "You do have a pathway to get back here legally that would take days, maybe weeks, not years." Mike Huckabee supported Comprehensive Immigration Reform Amnesty that failed in the US Senate and was rejected by a large majority of Americans. He stated that those who opposed the legislation are "driven by racism or nativism." Mike Huckabee has distorted the goals of "attrition enforcement" and the positions of Mark Krikorian by adding visa expansions, expedited visas, and "touchback", which would counteract enforcement measures. ALIPAC's President William Gheen then lead a team of illegal immigration and amnesty fighters to Des Moines, Iowa, in the middle of the GOP Presidential primaries of 2008 and ALIPAC supporters helped pay for radio and robotic call ads warning voters about Mike Huckabee's amnesty stances. Shortly after that battle, Mike Huckabee's Presidential campaign fell from first place into the back of the pack due to his support for amnesty for illegals and attempt to trick and deceive GOP voters! Please use this information to warn everyone you can about the duplicity of Mike Huckabee and his camouflaged support for amnesty for illegal aliens, and work hard to make sure he never achieves any elected office again, much less the Presidency of the United States! Don't give Huckabee your email under any circumstances! Last edited by ALIPAC; 07-24-2015 at 11:34 AM. No need to round them up - stop the jobs and social services to non citizens here w/o permission and they will find their way home. ALIPAC and imblest like this. Please check out and utilize the online activism strategies we describe in this training video to increase your power in the fight against illegal immigration and amnesty supporters! JMO, religious fanatics are not desired politicians, and this one proves my point valid. Our allegiance oath says under God, not by God. We should obey that , too. since Huckabee is trying to get on stage in Iowa tonight with Trump! 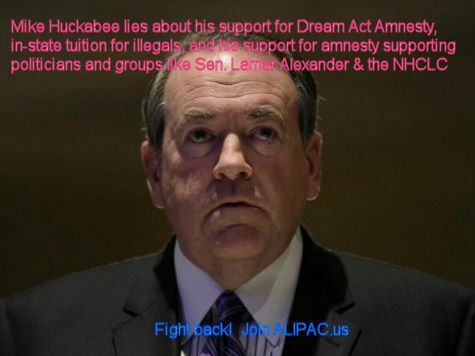 ALIPAC: Mike Huckabee's Shamnesty for Illegal Aliens! NEW POLL: Is Mike Huckabee for amnesty?